It is such a dreary rainy day here in Orlando…but I will admit, it’s kinda nice. We’re all relaxed here at the house, the kids set up “camp” in the living room and we’ve watched lots of Christmas shows this morning. Not sure how long this relaxing atmosphere will last, but I’m enjoying it right now! We are having a graduation party for our nephew on Saturday. Friends and family will be over and of course there will be a ton of food. Everyone is bringing a little something…I am making the main dishes, plus a few extras because I just can’t help myself. These nuts are one of those “extras”…they were super easy and are so tasty. The rosemary and butter make them savory…but the cayenne gives them a kick that I just love. They are going to great with the fabulous cheese plate that my niece is going to put together. Melt butter with dried rosemary, salt, and cayenne. Pour this mixture over 3 cups mixed nuts, tossing to coat them. Bake the nuts on a cookie sheet for 10 minutes, stirring occasionally. 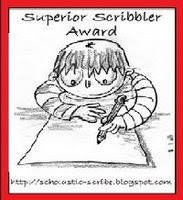 Superior Scribbler award to me! Stay tuned…Aggie’s Kitchen will be having it’s first giveaway very soon! I bet the rosemary is so good! They look wonderful, I’m going to try and roast some this weekend. I love these to munch on throughout the holidays. They are always a big hit at get togethers too! These sound great…what a perfect thing to have a bowl of sitting around during the holidays! mmmm these look great! They will make a beautiful app at your party! Enjoy it! Oh boy! I could keep eating these all day long, a very dangerous thing to have on hand for me! I love nuts I bet these tasted great infused with rosemary. 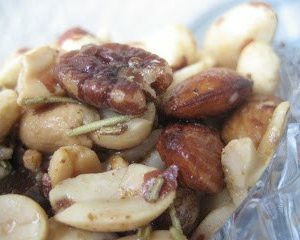 Oh, I love all kind of mixed nut combos, but I’ve never had them with rosemary before! That sounds amazing!! With a kick indeed. These nuts look fantastic! Congrats on your award. I’ve never had rosemary with nuts before! I bet these smelled just terrific! These wouldn’t last until Saturday in my house! YUM! I make a similar one with just cashews from Ina – it’s delicious! Those nuts look great! Yum! Mmm, I love rosemary! Sounds delish and looks pretty easy too, great dish for the holidays. I love nuts with rosemary. I make the Union Square recipe which is very similar and it has a bit of brown sugar. Yum. I’m hosting the family for Easter dinner. I might have to make this to serve with the appetizers.